It‘s the middle of the week, you open your fridge and see the bags of wilted leafy greens, sad-looking broccoli and carrots that are probably going off since you bought them a couple of weeks ago. You can’t be bothered to spend time sorting it all out, so you just throw everything away and order a pizza. But sadly, it’s a huge waste of time spent on shopping, which could have been used for something else. It’s also pouring money down the drain since you’re throwing all this produce away that could have potentially become nutritious meals. And most importantly, it’s bad for your health because, let’s face it, pizza has never helped anyone become fitter or feel good. 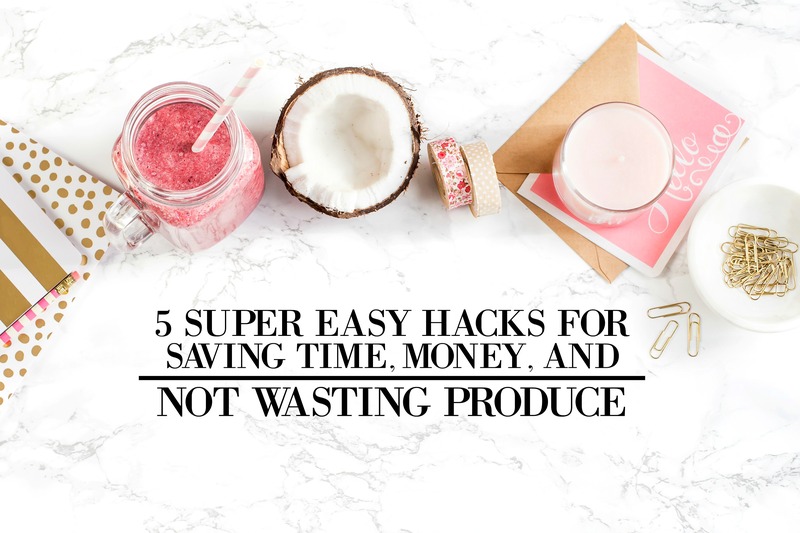 But these five smart hacks will make you save your precious time and cash and turn you into a healthy-cooking pro. A bunch of bananas have been sitting in your kitchen for a while and they‘re going all brown. Don‘t worry, you don‘t need to throw them away. Simply peel them, break into 3-4 parts and freeze (use either a freezing bag or a plastic box suitable for freezing). This trick will not only save your bananas but, if you haven’t yet discovered the endless possibilities of using frozen fruit, be ready to experience the whole new world of healthy breakfasts and desserts. Did you know that using frozen bananas in a smoothie makes it taste like a delicious creamy milkshake? You can also make ice cream that is actually good for you! Simply throw frozen bananas and some coconut milk into a high speed blender or a food processor, blend until smooth and here you have a delicious soft-serve! Chocolate lovers may add some cocoa powder or raw cacao. And you can also add berries, mango, pineapple, vanilla extract, etc. The possibilities are endless! This trick does not only apply to bananas. You can freeze any other fruit or berries. Just make sure that the fruit is ripe, peeled, and chopped into pieces that your blender will be able to handle. Wasting the whole bag or pot of fresh basil, mint, oregon or any other herb (because you needed only a few springs for your special recipe) is already history with this smart trick. As soon as you buy some fresh herbs, wash them, dry with paper towel (and maybe even leave them to air dry, to make sure there’s no moisture on them). Then de-stem the herbs and place the leaves in a clean and dry mason jar. This way the herbs will stay fresh in the fridge for 2 weeks or even more. Plus, they‘re already washed and de-stemmed, so it’s so super easy to just throw some basil leaves on your pasta, rosemary on your baked potatoes. Or mint to decorate your soft-serve banana ice-cream (see the tip above) or make a cup of tea. Here’s a chart for ideas to use for your fresh herbs. Who has time to make breakfast in the morning? Wouldn’t it be amazing if you could open your fridge and grab a delicious and healthy meal? Chia seed pudding or overnight oats are perfect for this and the good news is that you don’t even need to spend much time making it the night before. It takes a maximum of 5-10 minutes. You simply mix chia seeds and/or oats with dairy-free milk (like almond or coconut milk), add the desired toppings, place it in the fridge and let the alchemy happen overnight. This is the ultimate time saver! Double today’s dinner, and pack the rest for tomorrow‘s lunch. This tip is great for making soup, stew, pasta sauce, stir fry, casserole, burger patties, etc. You can even freeze the extras! Simply divide the food into single serving portions and freeze, so you can reheat them later. Planning your meals in advance is a great way to know what amount of groceries you’ll actually need, so you won’t end up wasting produce. Another quick tip: do your main grocery shopping once a week, using the shopping list that you create based on your weekly plan. This will save you so much time since you won’t need to go every other day or wander around the supermarket trying to decide what to buy. These 5 easy tips might save up to a couple of hours and hundred dollars a week. And doesn’t it feel great to be in control of your time and what goes into your body? Leave a comment below and let me know which tip was your favorite and which ones you’ll start implementing this week.